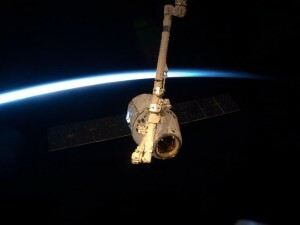 Think of me sometime between 2:30-4:30 a.m. EDT, when I’ll be in bed with my iPhone, watching the NASA TV coverage of the un-berthing of Dragon. Think of me again about five hours later, when I’ll be struggling to be productive on three hours of sleep. Click on the image to download wallpaper in (NASA’s) standard sizes. Next Tuesday/Wednesday (depending on your location on Earth), you may have the opportunity to witness the transit of Venus, or a view of the planet against the backdrop of the Sun. Once every century or so, Venus passes between Earth and the Sun, presenting itself as a moving black spot. Actually, transits happen twice every century or so. Every 105.5 or 121.5 years, Venus passes between us and the Sun; eight years later, it passes by again. But after that second pass, we need to wait another 105.5 or 121.5 years. The last transit was in 2004, so if you miss this one, you’re out of luck in this lifetime. In theory, viewing a transit is easy. It takes hours—typically around six—for Venus to complete the crossing. But ideal viewing requires ideal positioning: if you’re on the Pacific Rim, you may be able to follow the entire transit; if you’re in North America, you’ll only see the beginning of it; in Europe, west and south Asia, Africa, or western Australia, you’ll see only the end of it. Check with your local astronomy club or observatory to see if they’ve planned any special viewing events (more on that at the end of this post). Eye protection: again, easy in theory. Those eclipse shades or #14 welding glass you bought for viewing the recent solar eclipse will work for this, too, as long as you have better eyesight than I do. I’m not likely to see Venus with the naked eye. This means I need to use the appropriate solar filters and projectors on my telescope, or go find someone else with this equipment, since going blind is not on my agenda this summer. For some safety advice and a list of helpful equipment suggestions, visit transitofvenus.org. We’ll be heading down to Lake Monroe next Tuesday to take advantage of the equipment and knowledge of the Indiana University Astronomy Club and Stonebelt Stargazers. See Visit Bloomington for a short description of the event. The DNR has a flyer (.pdf) available for download as well. Activities for children run from 1:30-5:00 p.m. EDT next Tuesday, June 5, at Paynetown SRA (Lake Monroe). Short videos about the transit will be playing from 3-5:00 p.m. EDT. Transit viewing will be from 6-8:00 p.m. EDT. If you’re reading this from the University of Illinois, you should make plans to head over to Parkland College next Tuesday. The UIUC Astronomical Society and the Champaign Urbana Astronomical Society will be setting up west of Parkland’s Staerkel Planetarium around 4:30 p.m. Transit begins at 5:09 p.m. CDT and they will make sure you are viewing it in a safe manner. If you’re north of Bloomington, Indiana and Champaign-Urbana, Illinois (that is, in the Michiana region), check out Midwest Treasure: Trove (download flyer here). There are at least five public viewing sites set up in the South Bend/Dunes area of Indiana. Good times! Finally, I’ve linked to a NASA video above to give you some background on the transit, but space.com has a nice write up on the (early Modern) history of human response to the event. 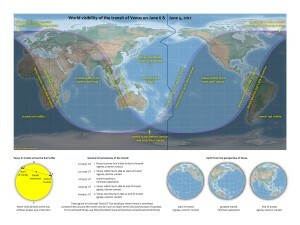 ETA: Visit NASA’s Transit of Venus Event Locations to find a viewing spot near you! We did get up to watch the ISS + Dragon capsule flyover at five o’clock this morning. The pair came up in the west, reached a maximum altitude of 36 degrees, and set in the north-northeast. Dragon is a pretty subtle beast–I’m not sure we would’ve been able to spot it in the slide into astronomical dawn if we hadn’t known to follow the path of the ISS. It doesn’t come close to the magnitude of the Space Shuttle. Once Catherine broke out the binoculars, however, we had a great view. 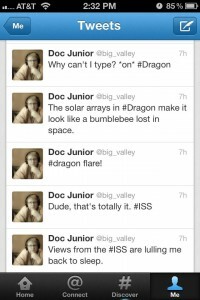 Since Dragon trailed the ISS by only two degrees or so, both spacecraft fit in the magnified field of view. 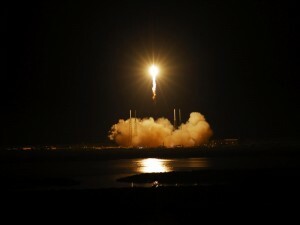 I had every intention of going back to bed after the four-minute flyover, but of course, I had to tweet about it and so got sucked into watching NASA’s coverage of the Dragon fly-under of the ISS. 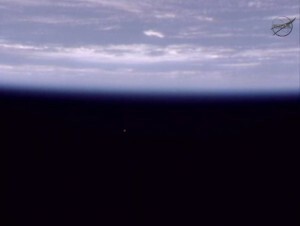 Dragon capsule as viewed from the International Space Station, May 24, 2012. What happens when I try to type at stupid o'clock in the morning. Today was about testing the system. While the fly-under brought Dragon within 2.5 km of the ISS—in other words, exactly where it was supposed to be at the time—more exciting was the moment the capsule’s strobe light powered on in response to a command issued from the ISS. 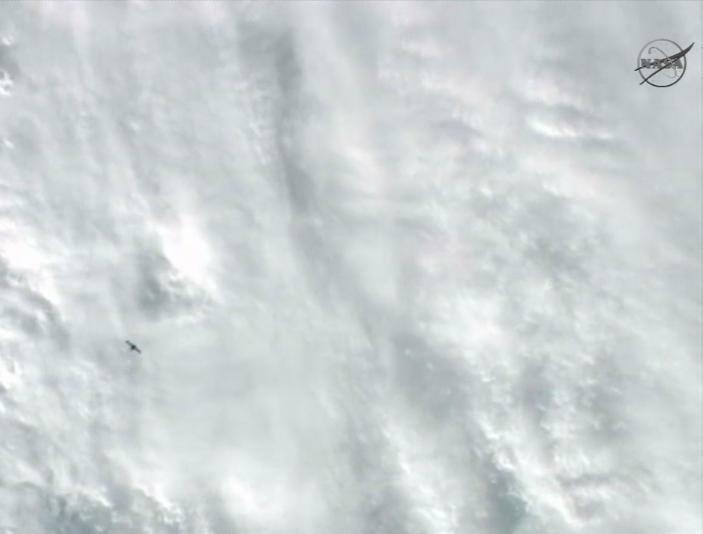 This confirms that the ISS astronauts can communicate with the capsule, a necessity when guiding it into its dock on Friday, May 25, 2012. 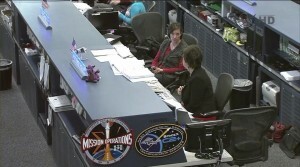 You might also have noticed that NASA has tossed a few toy dragons around the room. 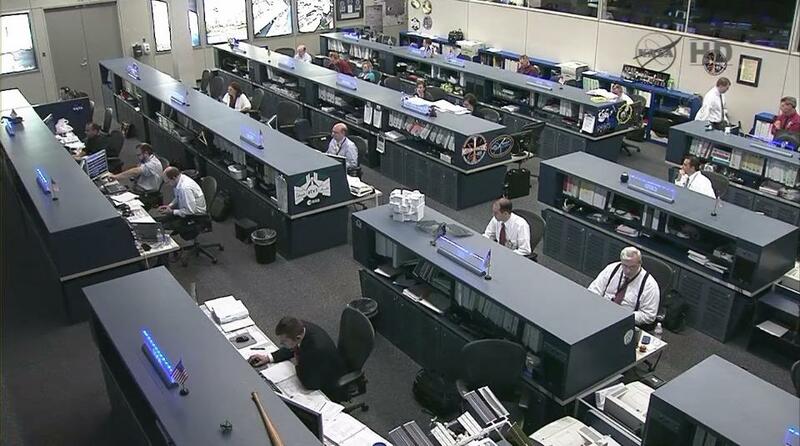 Even so, nothing in this room really leaps out as “Not NASA.” NASA tends to update, never fully overhaul, their aesthetics and spatial arrangements. 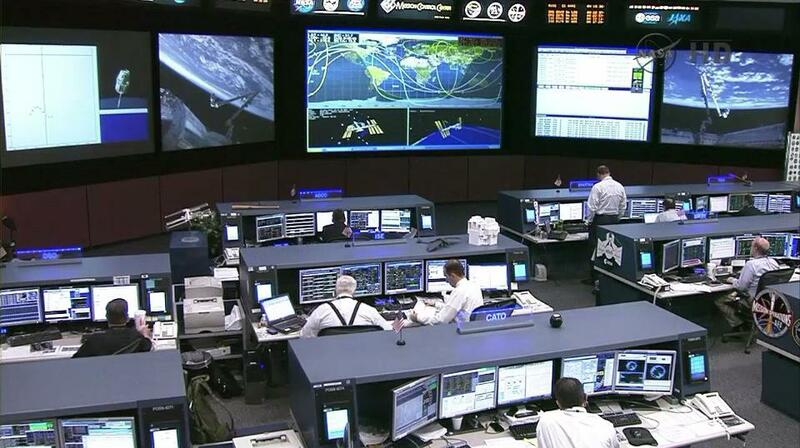 This point became very clear whenever SpaceX Mission Control in Hawthorne, California, came on the screen. That is not a room put together by NASA. That looks like every IT conference or training program I’ve ever attended, and I’ve attended a lot. I see a suit, but I also see the ubiquitous polo shirt and button-up short-sleeve dress shirt. And I swear that’s a baseball cap down front. 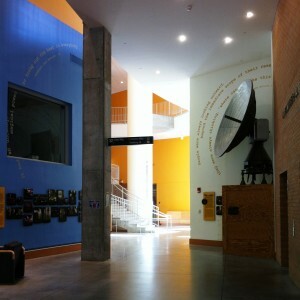 I see light coming in through floor-to-ceiling glazing (check out Ian O’Neill’s launch day photo of the same space). No rigid rows—hierarchy is subtly undermined by those bent tables. 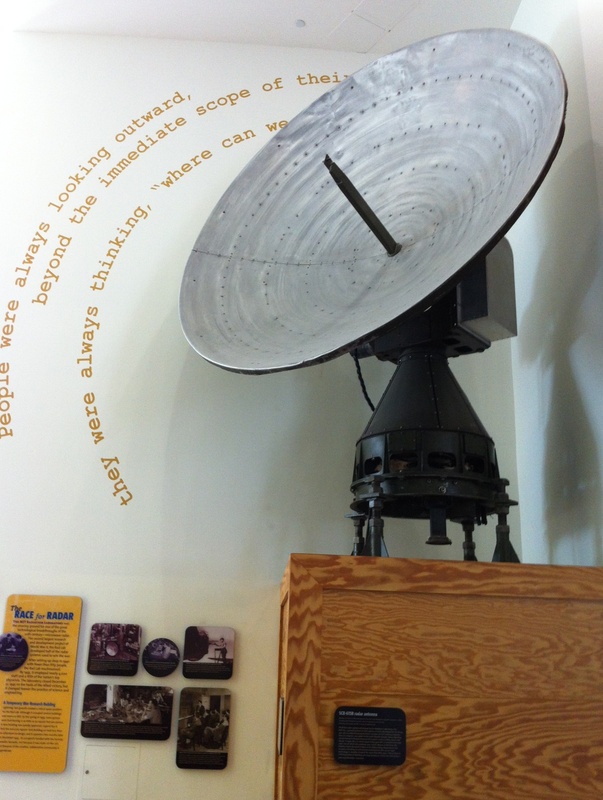 We’re looking at an entirely different space culture than the one cultivated by NASA. 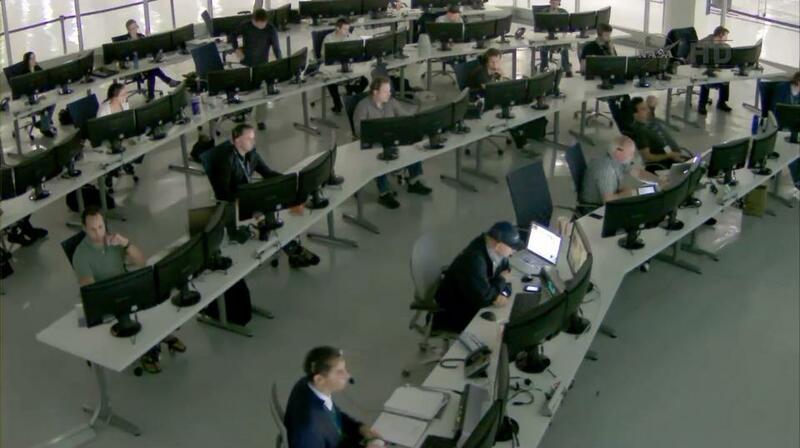 A quick-and-dirty reading of the two Mission Controls could lead to the conclusion that private industry embraces transparent operations, while the NASA (the U.S. Government) still operates in Cold War super secrecy. I know this isn’t exactly true, but that’s the message the architecture is sending out. If I was NASA, and I wanted to be part of the future of space exploration, I’d do something about the contrast between the two images. You know how to tell you’re getting old? If you wake up at 3 a.m., realize a Falcon 9 rocket will be going up in 44 minutes, but don’t reach for the iPhone next to the bed because you’re too tired to watch a livestream of the launch, you might as well check yourself into the old folks home ’cause life is all downhill from there. 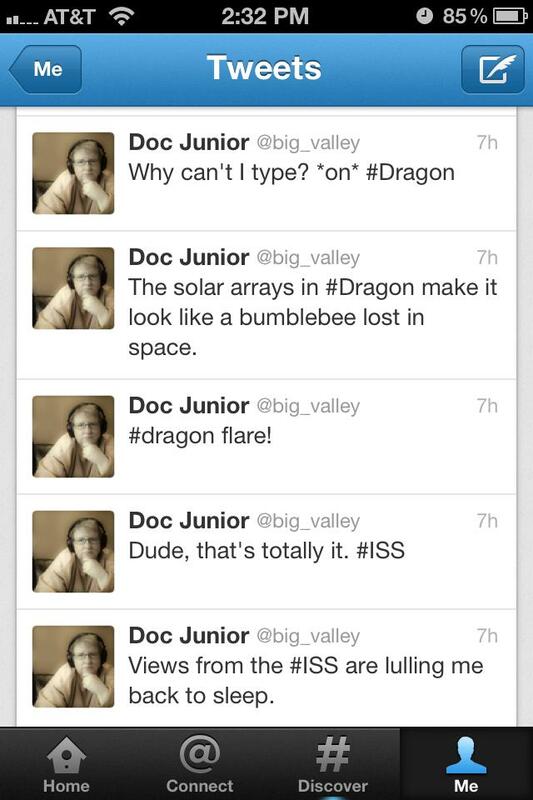 In my defense, I did stay up all night to watch SpaceX’s first launch attempt at 04:55 a.m. EDT on May 19, 2012. The launch scrubbed at T-0.5 because of a high combustion pressure reading (faulty check valve) on Engine 5. Lift off didn’t happen and I instantly fell asleep. Because the launch window was only one second long, SpaceX was forced to wait until May 22, 2012 for the next attempt. Remind me never to get involved in an operation that depends on a one-second launch window. That’s insane, really. Today’s wallpaper shows the successful SpaceX launch from LC-40 on Cape Canaveral Air Force Station at 03:44 EDT yesterday (Tuesday, May 22, 2012). 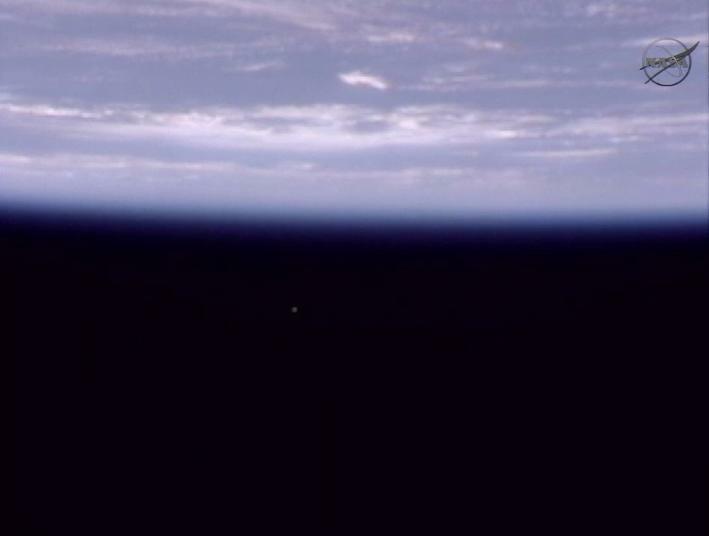 If you’re lucky and don’t need much sleep, you may be able to catch a glimpse of the Dragon capsule orbiting together with the International Space Station. Just pop over to the Heavens Above site, configure it for your current location, and follow the SpaceX/Dragon and ISS links in the “Satellites” category. The site will provide you with everything you need to know for a successful observation of an ISS/Dragon pass over: date, time, altitude-azimuth, and magnitude. We’re setting an alarm for tomorrow’s 03:59:59 EDT pass, when the Dragon capsule and the ISS will be only one degree apart. 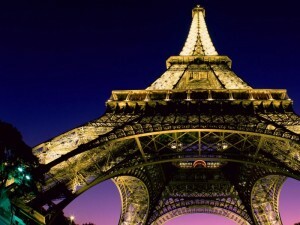 Click on the image above to download standard sizes of wallpaper. ETA: As Danny Sussman (@TheSuss) points out, if the times on Heavens Above seem wrong (the site isn’t recognizing Daylight Saving Time for my current location, for some reason), you can bring up flyover times on the NASA app if you have an iPhone or Android. NASA updated the iPhone version earlier this week. The update stalled out on my phone for a frighteningly long time, but once it went through, all was good and accurate. 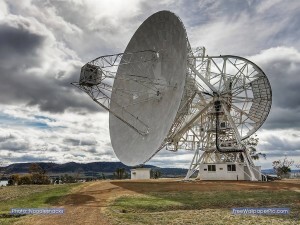 Because you can never have too many radio telescopes, today’s wallpaper features the Hobart 26m antenna at Mount Pleasant Observatory. Click on the image to go to the download page. Once on the download page, click the button “Give me the matching wallpaper” and follow the provided directions. In addition to trying to wrap up the typical end-of-the-semester tasks last week, I also made a quick trip to MIT (Cambridge, MA). I had a few hours to myself on either side of my meetings and I put those hours to good use by walking as much of campus as possible. Needless to say, MIT sits at the intersection of my primary research foci, architecture and science. Perhaps also needless to say, my first stop was the Stata Center, the most controversial building on campus (still, even though it opened in 2004). Early dissent over the Stata Center had little to do with the design itself and a lot to do with emotional and intellectual attachment to the building it was slated to replace, Building 20. 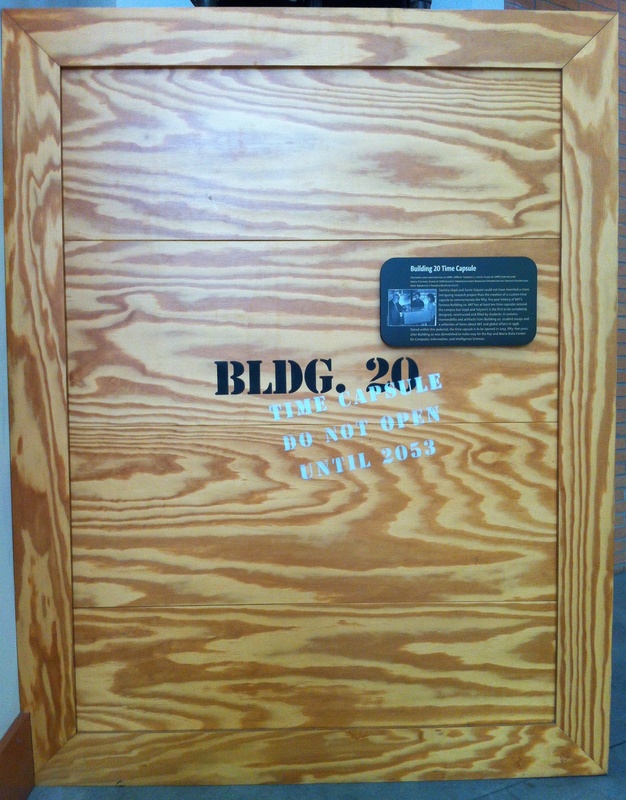 For the purposes of this site, the most notable thing about Building 20 was the fact that it once housed the Radiation Laboratory funded by the National Defense Research Committee (NDRC). 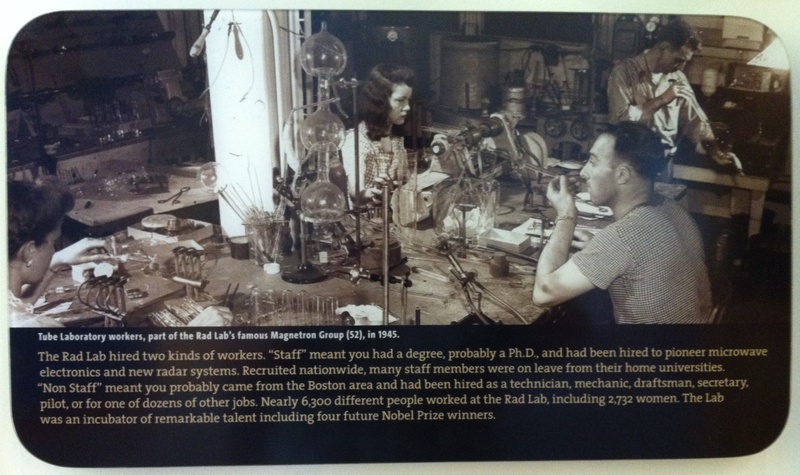 Although MIT’s involvement with military research was always seen as problematic by some (and those sentiments would increase during the Vietnam era), during World War II, Rad Lab became the control center for a global research network centered on applied microwave physics. 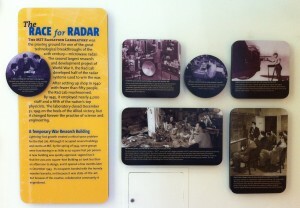 Most of the radar and microwave communication technologies developed during the war came out of the Rad Lab; the British military developed the rest. The photos above show the homage to Rad Lab in one of the hallways of the Stata Center. 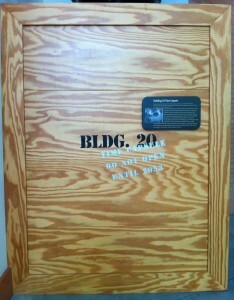 The radar antenna stands on top of a wooden crate that holds a Building 20 time capsule. 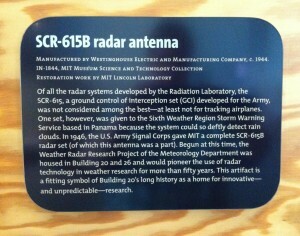 Kudos to the person who chose this particular antenna as representative of MIT’s research. As the accompanying signage explains, the SCR-615 radar system was “not one of the best” (possibly explaining why there was a spare dish sitting around the MIT Museum). You know you’ve got confidence when your celebratory display highlights not just your research successes, but your research disappointments. With the end of WWII came the end of Rad Lab, but not Building 20. Research in microwave physics was absorbed into the Research Laboratory of Electronics (RLE), housed in the A wing of the building. 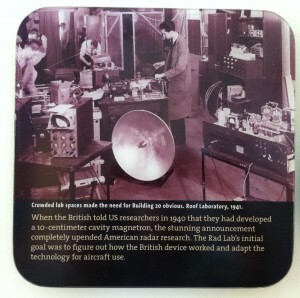 The Laboratory for Nuclear Science (LNS) took up another good chunk of the space. 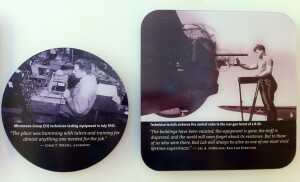 The military maintained a presence in Building 20 in the form of ROTC headquarters as well as a few U.S. Navy offices. 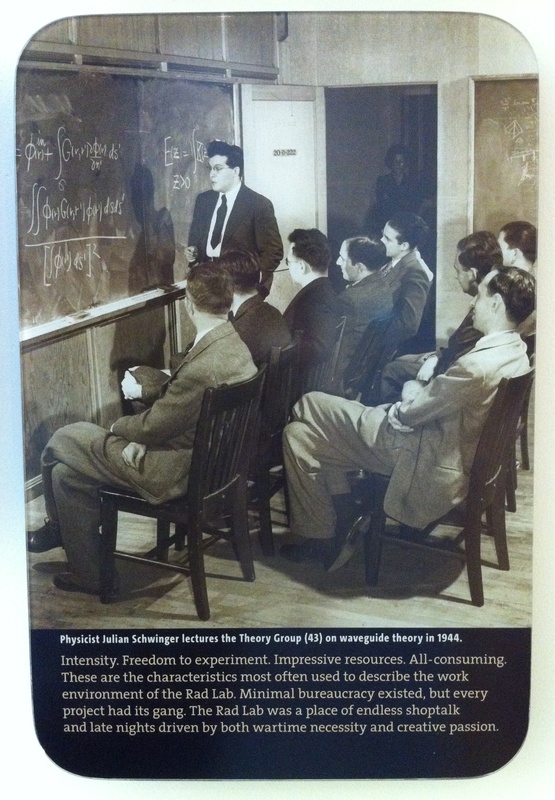 More famously, the building also became home to MIT’s linguistics department. One wonders how different Noam Chomsky’s ideas about the military and U.S. foreign policy would have been had the department been housed in Kresge Auditorium (probably not THAT much different, but still). Building 20 is no more, of course. In its place stands the Stata Center, a 3-dimensional wonderland of space designed by Gehry Partners LLP. 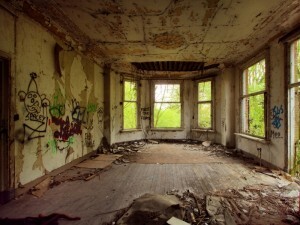 The controversy comes from the multitude of problems reported by users of the building. MIT eventually sued (and then settled with) Gehry. I have much to say about the Stata Center, so feel free to contact me if you’re interested in my analysis. My photos of the building are available on flickr, as are my photos of other parts of the MIT campus. If you’d like to read a warm and fuzzy article about Building 20 and its role in MIT’s campus culture, see “A Last, Loving Look at an MIT Landmark—Building 20,” RLE undercurrents Vol. 9, No. 2 (Fall 1997). [download .pdf]. If you’re interested in campus tensions during the Vietnam War (MIT was the largest defense contractor in the U.S. at the time), read Stuart Leslie, “‘Time of Troubles’ for the Special Laboratories,” in Becoming MIT: Moments of Decision, ed. David Kaiser (Cambridge: MIT Press, 2010), 123-43. More confidence: Frank Gehry’s firm doesn’t even have a real website. Gehry Partners LLP has zero information about the firm and its projects. Gehry and partners don’t really need to invest time and money in their own advertising—trade and academic publications do all their publicity for them. 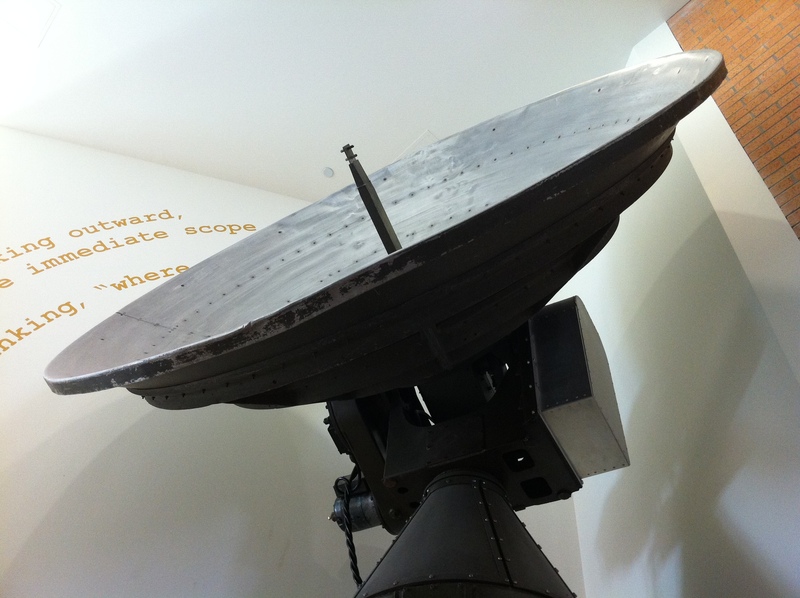 We’ll return to our regular Observatories & Instruments programming next week.